Mitch had been eyeballing this one box all night–a big, perfectly square box that held a random collection of blog swag and craft debris that needed to be cleared from the kitchen table one night. Sadly, boxing up clutter and stashing it in the basement is how I clean house around here. I have plenty of boxes this time of year, those Amazon Elves are working overtime! So let me be upfront with you…this is NOT a professional craft. This is something my 8 year old Minecraft fanatic came up with, and I just found him the parts he needed and helped with the sharp tools. 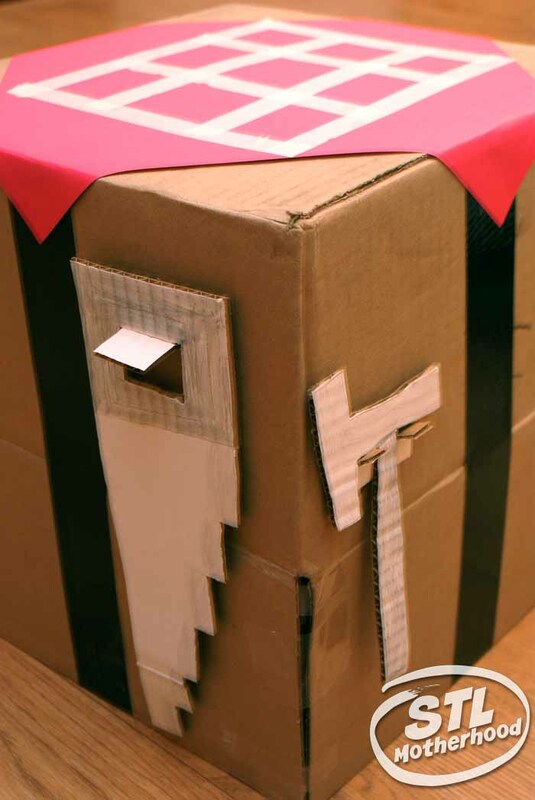 But these are really the best crafts–sometimes you just need to hand your kid some cardboard and step back. About half way through the project, when I was adjusting some of his tape to make it straighter, he glared at me and said, “Are you going to put this on your blog? ?” I admitted the truth, and told my kid his crafting table was SO AWESOME that it had to go on the blog. And I’d stop messing with it. A square cardboard box. Ours is 13×13. If you don’t happen to have a perfect sized box to upcycle, you can buy boxes like this at Walmart in the office supply section for under a buck. That’s where we got a nice clean box for a Halloween Enderman costume. White cardstock or cardboard. 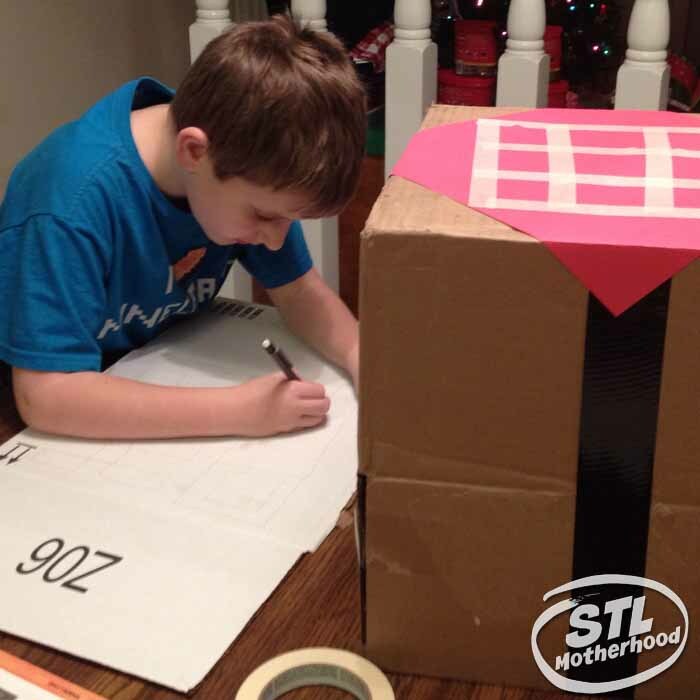 We happened to have a white box from daddy’s last sneaker order–Zappo’s has really nice boxes for crafting! Red 12×12 Scrapbook paper. Mitch studied a toy crafting table and decided that it has a “table cloth” on it…and his would be red. If you’re trying to stick with a vinialla Minecraft crafting table, it can brown. The paper will help cover up the seams on the box, so don’t skip this step. We used scrapbook paper because I happened to have lots of it, and 12×12 was a perfect size. Use what you got. Lots of tape! We used packing tape, double stick tape, black duct tape and masking tape. We’re tape fanatics. Pencil, crayons, razor knife & cutting board. Mitch drew his Minecraft tools on the white cardboard, then I cut them out for him. Use the packing tape to stabilize the box. Mitch flipped the box upside down and left the flaps on to make the box taller. He used packing tape to hold the flaps together. Then add the black stripes with duct tape. Yes, this could be paint, but we love tape. And it’s quick. Go from the bottom (open end) and wrap up one side, across the top and down the other side. I couldn’t get Mitch to bother with finding the exact center with a ruler first, so he just eyeballed it. Add the scrapbook paper table cloth to the top. Crease the corners to they fold over the edges of the table nicely, and try to center on the black tape. Glue the paper to the box. 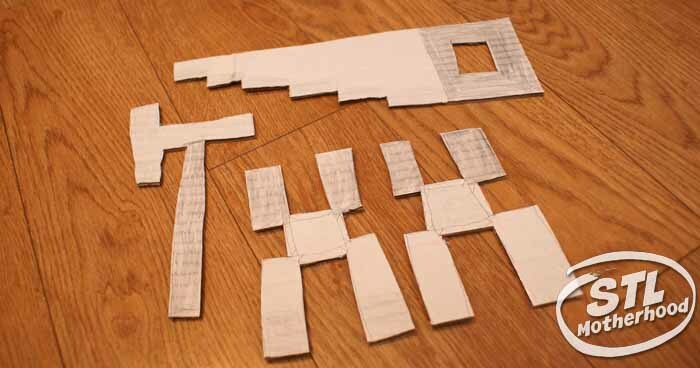 Make the crafting grid with masking tape. Mitch did this bit himself, so it’s not exactly square. He said it didn’t matter, so I believe him. If you’re not familiar with a crafting table, the grid is 3×3 cubes. Draw the tools, color and cut out. Mitch drew his tools freehand, while looking at a crafting table toy. He made them Minecrafty, but you can make your more or less realistic. This is a kid’s project, after all. I cut the tools out for him with a razor knife. Make hangers with scrap cardboard. The final touch! We just made little flaps of cardboard and glued them to the box to hold the tools. Play tips! Mitch has a lot of Minecraft blocks, so he placed the blocks on the crafting grid to “craft” items. He had a lot of fun using his imagination with his creation! 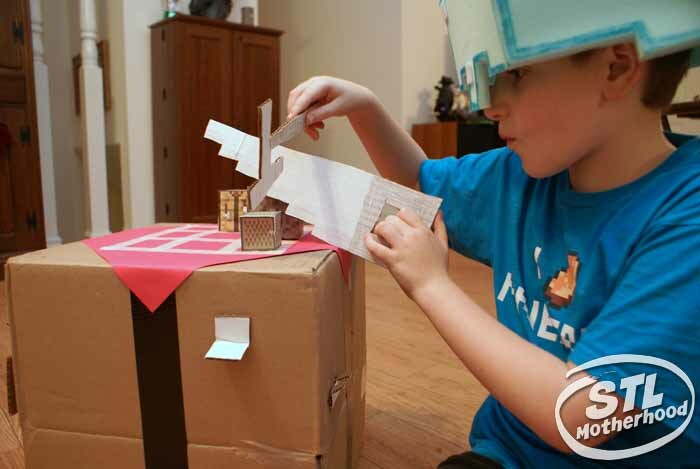 I love homemade toys like this–it’s a great way to get your kids off the computer and playing in the real world. Or at least, a non-virtual world! Mitch also pointed out that he could flip the box over and use it to store his Minecraft tools and blocks inside when he wasn’t playing with it. Great idea kid!